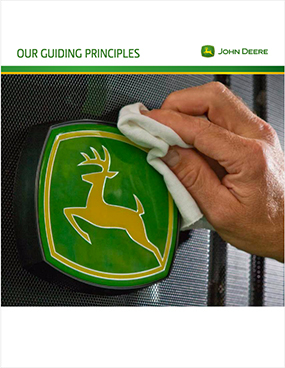 At John Deere, we have four core values – integrity, quality, commitment, and innovation. Since our founding in 1837, our reputation has been built on these core values. By adhering to our core values, we are ensuring that our business is as great as our products. We will never compromise our core values because we aspire to create genuine, sustainable value for our employees, customers, and stakeholders. Our core values provide an enduring foundation for our success. As we move into the future, we must ensure these values remain vital and relevant and that they continue to guide the way we do our jobs and the way we treat our customers and each other. Our Guiding Principles serves as a guide for serving those linked to the land. It complements our corporate code of conduct, corporate ethics policy, and supplier code of conduct, which describe our practices and policies in detail. 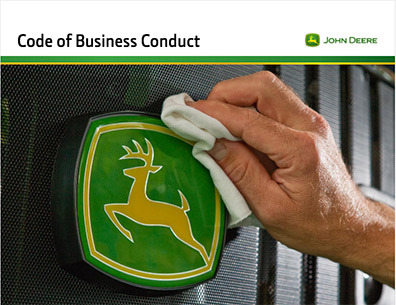 At John Deere, we are committed to conducting business in accordance with the highest ethical standards. This means how we conduct ourselves and our global work is more than just a matter of policy and law; it's a reflection of our core values. Our Code of Business Conduct provides specific guidance to all employees. The Code outlines how we can and must uphold and strengthen the standards of honor and integrity that have defined our company since our founding. Since 1837, John Deere has been a responsible and successful enterprise, committed to the highest standards of social responsibility across our diverse, worldwide supply chain. We insist that all of our suppliers treat workers with dignity and respect, provide safe working conditions, use environmentally responsible manufacturing processes, and represent the highest ethical standards. Our actions, from on-site supplier audits and supplier training to our consistent fair treatment of suppliers, demonstrate this commitment. 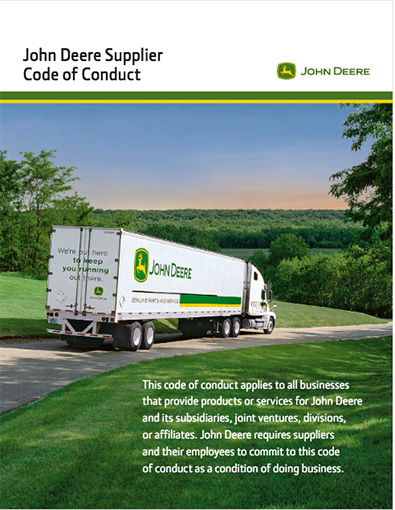 To ensure that all of our suppliers conduct business with a high degree of integrity and in a socially and environmentally responsible manner, we hold them to the John Deere Supplier Code of Conduct. No offerings at this time.